I’m going to tell you my encounter with Brahmaland…. During my first day I learned a lot of things that I knew absolutely nothing about. 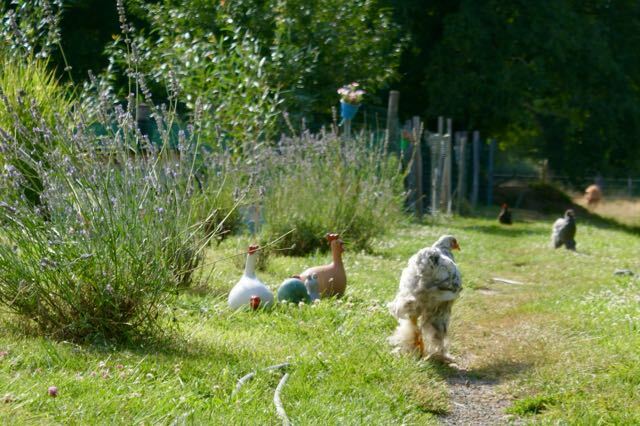 I discovered chicken breeds that I had never heard of (Orpington, Pekin…). I didn’t know there were so many of them ! I literally fell for the Pekins, these little balls of fluffy curly feathers ! I was able to observe different chicken behavior and habits…not always easy regarding some of them (Stylo); and so cute for others (little Lanzo). I had to succumb ! I loved the idea of putting little ‘coats’ on the hens (custom-made of course !). They look very pretty ! A great idea and a good way to make sure that the hens are not damaged or wounded. The eggs are under great care and surveillance !! Wether it’s from the hens or from Mommy Gaëlle :-). Hatching time is always a much-awaited and magical moment. Fertilized eggs are carefully wrapped-up for transport…Gaëlle always adds a little something to the parcel, wether it’s a drawing or a fabric hen. These little details really make a difference, they are made with love ! I loved it. I was also very impressed to find out that the orders came from all over the world and that the eggs traveled so far (by post, by plane…). I had no idea that so many people were so passionate about chickens. I find that amazing. I was astonished to see how much knowledge Gaëlle had acquired during these past 3 years. I find that great to share it with so many people thanks to the internet. It’s so fulfilling. I would say that Brahmaland is a place where serenity and calm are everywhere…The surroundings are very peaceful and quiet and the chickens’ little houses are very comfy. It’s a small paradise where chickens are treated like kings and live happily ever after.